This is what it has come to. I figured if I am going to do a week of unhealthy eating, then why not go for an ultimate in trashy food for drunk people. Honestly, it seemed like a no brainer as I have been seeing the ads on TV for the nacho cheese fries from Taco Bell for like a month now. While they aren't exactly known for healthy or nutritious food, I must say they do an excellent job of marketing and making you think they have some "out of the box" food that you really must try. I mean remember that taco made of chicken , the chicken chips or the biscuit taco? Well, I'll posit that when they came up with these ideas it is because they have bits and pieces of past food ideas that didn't work or they mix and match stuff they already have and just re-package them together (or maybe I'm a food cynic). I can just see the meeting now. "Hey, how bout we take our seasoned fries and serve with our canned nacho cheese sauce." "But customers already do that." "Sure, but now we can put them in a tiny container and slap it on the dollar menu and use Josh Duhamel to convince people it is some hot new thing." "Great idea! Make it happen." Or something like that. Well, it got me in with all the hoopla and that $1 price is hard to pass up in my current jobless little world. Plus, it's french fries and cheese for chrissakes! Nothing says make me fat and happy like that combo. and got two more to make it three total. The whole time I'm doing this I know I have fallen right into Taco Bell's trap of "well, they are only a dollar, let's get more!" I'm not foolish, I worked a number of fast food places in high school so I'm aware. Just in the moment, I was hungry and my stomach got the better of me. But it does fall right in with unhealthy week in big way. Basically these are exactly what I said they were above, seasoned fries with a side of nacho cheese sauce. Not much ingenuity here but they are definitely in their wheelhouse of food that will appeal across the board when that greasy cheesy food craving hits you. We all get it so don't sit there and shake your head like it never happens to you, that's just denial. In essence, it would have been really hard to mess this up. 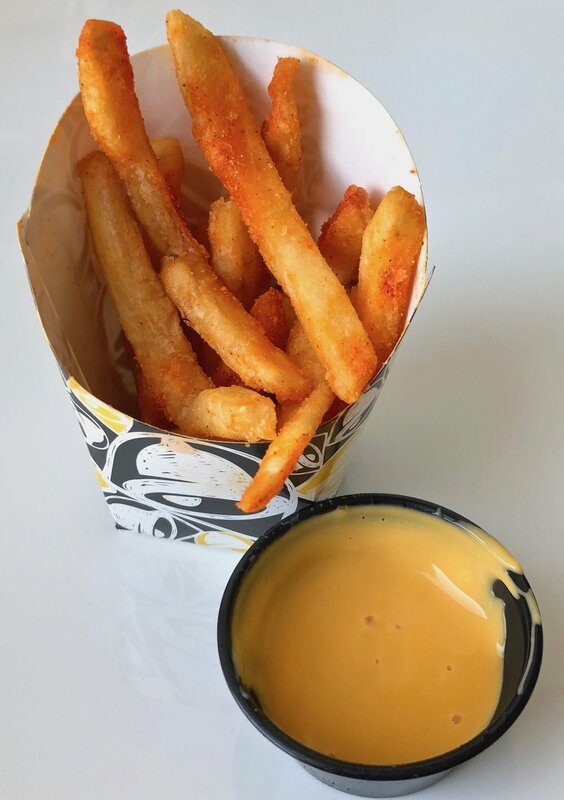 The fries were cooked and served hot and crispy and the cheese was all melty, gooey nacho-ness you expect from having that sauce squirted over pretty much everything they serve. Do you need three? No, I will say one of these was more than enough to get a taste for them and make me feel icky after eating them. Plus, they don't reheat well as I found out later that night for the ones I didn't eat when I first got them. Means these are pretty much an in the moment impulse food item and you should just get one and eat it as soon you get it. That's what fast food is in a nutshell after all. Evidently they keep saying these are for a "limited time" which means a limited time as long as they continue to sell or we ordered this many of them and we will sell them till we are out and then move on to our next marketing food gimmick to draw in us hordes of lazy fast food eaters and late night drunkards. Wait, this is California, make that stoned fast food eaters! #AMERICA! !